There are some people in our lives who are made alive to us, who inspire us, through the writings of those they have met and inspired. 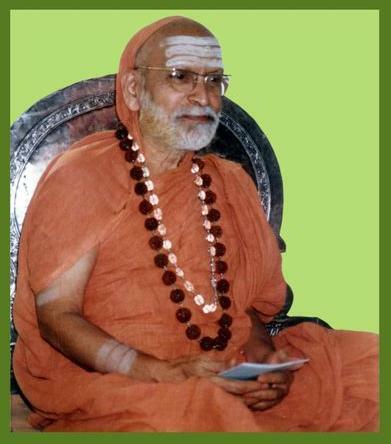 The 35th Jagadguru of Sringeri, Jagadguru Sri Abhinava Vidya Tirtha Mahaswamiji, is one such Mahatma in my life. The book “Yoga, Enlightenment and Perfection” is a record of the saadhanas of the Acharya soon after his ascending the throne of the Sringeri Peetham as the shishya of the 34th Jagadguru Sri Chandrashekara Bharati Mahaswamiji. One of the Acharya’s accomplished shishyas wrote down the dialogues he had had with the Jagadguru at the behest of the present Jagadguru, Sri Bharati Tirtha Mahaswamiji. Along with the work titled “The Crest Jewel of Yogis” (a brief excerpt is available here – http://tinyurl.com/pd7p8l6), this work made alive for me the idea of Ishwara, Guru, saadhana, Yoga, Jnaana, all the wondrous murtis of Ishwara, and somewhat made less alive the world of pleasures and experiences of various kinds. It was a turning point in my life to read these two books. I have experienced an unmatched joy (matched only by studying the Bhashya-commentaries of Bhagavatpaada Shankaracharya) whenever I have turned to them. The author-shishya has breathed life into his books by the will of his Guru bhakti, which is soaked in every one of the pages. The lucid conversations convey to us the simultaneously external simplicity and internal grandness of the Guru’s life and the earnestness of a shishya in understanding the intricacies of Saadhana from the sacred lips of the Guru who he sees as none other than Ishwara Himself. It is only in the Dharmic traditions that one relates to Ishwara as a friend and a mother, learns from Ishwara directly seeing Him as a teacher, does sushruusha (service) to Him with bhakti, is overcome with wonder and gratitude at His divine presence. All this is made possible directly and experientially in the physical domain because of the Guru who Himself embodies Ishwara. The author, reverentially addressing His Guru at every step, clearly has approached and learnt at the feet of His Guru with this spirit, and this shows in all of the books he has written. It is my humble prayer to the Jagadguru that the book “Yoga, Enlightenment and Perfection” reaches all sincere saadhakas across the world for all times. This book, amongst others, is a work of perfection of which the Acharya was an embodiment. May the world be enthralled in that Atman who was with us in the form of the great preceptor Himself. Our Acharyal (Jagadguru Sri Abhinava Vidyatheertha Mahaswamigal) adorned the sacred Sringeri Sharada Peetham as its 35th Pontiff. He was an unmatched authority on the scriptures, a peerless Yogi, a consummate Jivanmukta, an ocean of mercy and a perfect preceptor. The book “Yoga, Enlightenment and Perfection” contains a detailed account of His Holiness’s spiritual practices and His realization of and steadfast establishment in the Supreme. This book also serves as an authoritative exposition of Yoga, Bhakti, and Vedanta. A free digital version of this book is now available at www.svfonline.net for the benefit of all spiritual aspirants.